Injuries to the brachial plexus (the nerves that conduct signals to the shoulder, arm, and hand) can have devastating consequences, including loss of function and chronic pain. Fortunately, new advances in nerve surgery can yield marked improvement in movement and function of the shoulder, elbow, and hand, while simultaneously diminishing pain. 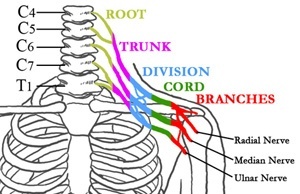 The nerves that make up the brachial plexus originate at the spinal cord and correspond to four cervical (neck) vertebrae and one thoracic (upper back) vertebra. The Nerves of the Brachial Plexus: the Radial Nerve, Median Nerve, and Ulnar Nerve. Figure 1: The nerves of the brachial plexus in relation to the spine, ribcage, shoulder, and arm The nerves divide and join repeatedly before terminating in several peripheral nerves that branch out to supply the muscles of the shoulder, elbow, forearm, and hand. In addition to "communicating" with the muscles that lift, lower, straighten, and bend the arm, the nerve complex serves as the pathway to communicate sensory perception to the brain. In adults, brachial plexus injuries are almost always the result of a high impact injury, such as a motorcycle, skiing, or snowboarding accident. In some cases, however, a tumor or radiation may be the underlying cause. Brachial plexus injuries in children usually occur at birth. In addition to performing a physical examination, orthopedists evaluate brachial plexus injuries using MRIs, CT scans, and electro-diagnostic tests. According to HSS physiatrist Joseph H. Feinberg, MD, electrodiagnostic testing (often known as EMG testing) assesses nerve function and is commonly used in the evaluation of brachial plexus injuries. "The test is primarily used to assess the degree of nerve injury and determine the location of the injury, and the resulting information is used to help understand the likelihood and degree of recovery," he explains. "A decision to perform surgery and the type of operation needed will often depend on this information." He adds that the EMG test can also be used to monitor recovery. The test entails stimulating the nerves with small electric shocks and inserting small acupuncture-like needles in certain muscles. The test can take anywhere from 30 to 60 minutes, depending on the complexity of the injury and the amount of information the physician requires. Avulsion: the roots of the nerves are torn away from the spinal cord. Multiple root avulsion is the most common diagnosis in high-energy traumatic brachial plexus injuries, such as occurs in a motorcycle or off-road vehicle accident. Symptoms include numbness, an inability to use the muscles in the shoulder, arm, and hand, and a crushing or burning pain. Patients with a severe avulsion injury may also have a drooping eyelid, a phenomenon known as Horner's Syndrome. Patients with a stretch neurapraxia may be able to regenerate healthy nerve tissue. However, recovery is unpredictable. In such cases, the orthopedic surgeon conducts frequent and thorough examinations over the first three to six months following the injury and performs additional imaging and electro-diagnostic tests, as needed. If there is no recovery, the patient is assessed for internal damage to the nerve, and surgery may become necessary. Although nerve repairs and nerve grafts have been used in the past to reconstruct disrupted nerves in the brachial plexus, these surgeries have met with variable success, and were often inadequate to restore function in patients with severe injuries. For the past decade, orthopedic surgeons at Hospital for Special Surgery (HSS) have used nerve transfers - in addition to nerve grafts and nerve repair - to restore function in these complex cases. While the concept of nerve transfer is not new – it was pioneered in the early 1900's – novel techniques of nerve transfer have accelerated the pace and extent of recovery of shoulder and elbow function. "The use of surgical nerve transfers has revolutionized our approach to these patients," explains Scott W. Wolfe, MD, Chief of the Hand and Upper Extremity Service at HSS. "With the operating microscope, we can transfer a portion of an intact nerve from a functioning muscle and re-attach it to the undamaged portion of a nerve from another." Previously, the surgeon harvested healthy nerve tissue from an uninjured site in the arm or the leg. Occasionally, nerves from between the ribs were harvested and transferred to the arm. More recently, Dr. Wolfe and his colleagues have identified specific nerve transfer sites within the injured area that offer even better results than those previously achieved with nerve grafts or chest wall grafts. Timing of the surgery is essential. "Ideally, we repair the nerves within three to six months following injury," Dr. Wolfe says. "Surgery can still be done later with some improvement in function, although at 12 months and beyond, our results are much less predictable, as the muscles are less able to be revived." Some patients who seek treatment with a chronic injury years after their initial trauma may also benefit from a surgery in which working muscles with their blood and nerve supply are transferred from distant parts of the body. Read more about one patient's experience with repair of a brachial plexus injury at HSS. Results of nerve transfer surgery can be dramatic, especially with regard to function of the shoulder and the elbow, according to Dr. Wolfe. "What is amazing is the degree of redundancy within the peripheral nervous system that allows us to detach a portion of a functioning nerve without causing a loss of strength or sensation, but then re-attach the same nerve elsewhere and regain lost muscle function in a matter of months," he explains. Common examples include using a single fiber bundle of the ulnar nerve to revive the biceps muscle of the arm, or a portion of the nerve to the triceps muscle to restore power to an atrophied deltoid muscle in the shoulder. While some advancements in the forearm and hand are on the horizon, it's important for patients to realize that sensation and function below the elbow, if injured, may remain limited. Moreover, patients need to understand that the first signs of muscle recovery may not be apparent until 6 to 12 months following surgery; gradual return of strength and mobility follow thereafter. Q: I think I may be a candidate for nerve transfer surgery. Do I need a referral from my regular physician? A: If you have been diagnosed with a traumatic brachial plexus injury, you may call our office directly. If you are not certain whether you may have injured your plexus, you should check with your primary care provider or a neurologist. Q: How will I be evaluated at HSS? A: A team of physicians, nurses, research personnel, and specialized hand therapists evaluates each patient and continues to work with him or her throughout the course of treatment. 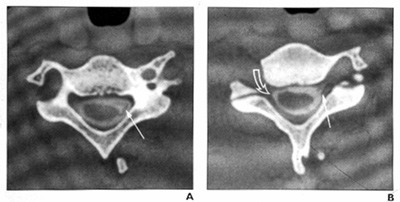 Specialized testing may be required, including computerized tomography (CT), myelography, magnetic resonance imaging (MRI), and neurodiagnostic testing. I prefer to fully evaluate each patient before advanced imaging or neurodiagnostic tests are ordered, so that a customized approach can be mapped, and unnecessary or duplicate testing avoided. Q: How long does this procedure take and when will I be able to return to my regular activities? A: Surgery for a brachial plexus injury can range from 3 to 12 hours, depending on the complexity of the case. Patients can expect to restrict their activity for at least four weeks following surgery; therapy for the upper extremity may be necessary for several months, as nerves and muscles recover. A: Most patients are discharged the day following surgery. However, in some cases, the procedure may be done on an outpatient basis. Q: Where will the orthopedic surgeon get the nerve that will be transferred? Q: What do the surgical scars look like? A: The appearance of scars may vary. The incisions can be a few inches in length and occasionally quite extensive, depending on the degree of injury. Plastic surgical techniques are used to close the incisions to minimize scarring. 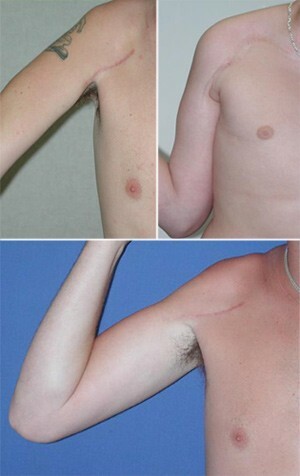 Some examples of postsurgical scars are shown. Q: Is there much post-surgical pain? A. Surprisingly little pain is associated with surgery for brachial plexus injuries. If needed, pain management specialists at HSS have extensive experience in helping patients feel comfortable throughout their recovery. Q: How can I cope with the crushing/burning pain in my arm? Will surgery make that go away? A: For most patients, relief from the pain associated with brachial plexus injury (as distinguished from post-surgical pain) is achieved at one or two years following surgery, although in some cases a longer period of time may elapse before the pain is controlled. For those individuals who continue to experience pain beyond this period, the orthopaedic surgeon may make a referral to a neurosurgeon, who may recommend an dditional surgery on the spinal cord known as Dorsal Route Entry Zone lesioning (DREZ). DREZ involves the removal of scar tissue and the use of an electrode on the damaged area of the spinal cord to stop pain messages from being sent to the brain. Q: If my surgery is successful, is there any chance the problem will recur? A: No, as long as you do not experience another injury to the area. Q: What kind of physical therapy will I do? A: Physical therapy for the upper extremity is essential. The program usually begins before any surgical intervention and continues for many months following surgery. Pool therapy is particularly important and biofeedback may also be helpful. Q: What kind of risks are associated with this type of surgery? A: Risks associated with surgery to repair a brachial plexus injury include failure to improve, tingling or diminished strength in areas of the hand or forearm (generally temporary), and post-surgical stiffness. The surgery can be long, and the resulting pressure to certain areas of the body can cause temporary pain; great efforts are made to pad these areas with special gelpads during surgery. Q: Why wasn't my brachial plexus injury treated at the time of my accident? A: When the injury is incomplete, it is prudent to wait to see if a brachial plexus injury will improve spontaneously. In many cases, this recovery does occur and surgery is not needed. Often the nerve injury cannot be fully appreciated immediately, and may be overshadowed by life-threatening injuries of the skull and brain, abdomen, or fractures and dislocations of the shoulder and arm. In more serious cases, repair of critical blood vessels to the arm may be necessary for the limb to survive, and nerve repair is planned as a subsequent, elective procedure. Q: How long should I wait before being evaluated for my nerve injury? A: Injuries to the brachial plexus should be evaluated as soon as possible. Your physician can then help you decide on the need for more diagnostic procedures and discuss with you the likelihood of spontaneous recovery, and the timing of surgery, if indicated. Ideally, if surgery is required, it should be completed within six months of the date of injury. For more information on treatment of brachial plexus injuries at HSS, please visit the Physician Referral Service or call 1.877.606.1555.